The ORCA convention is looking to be a big one. The host hotel (Clarion) is completely filled and we exceeded our held block. The spillover hotel is Quality Inn, less than a mile away. The phone number 92 520-979-3321. They still have 20 rooms available, ranging in cost from $102 to $119 night. Book quickly! Staying at the spillover, you can still participate in all events occurring at the host hotel, including setting up and participating in the group “room trading” in the ballroom. If you have questions, please call David Lehmann at 281-757-5054. 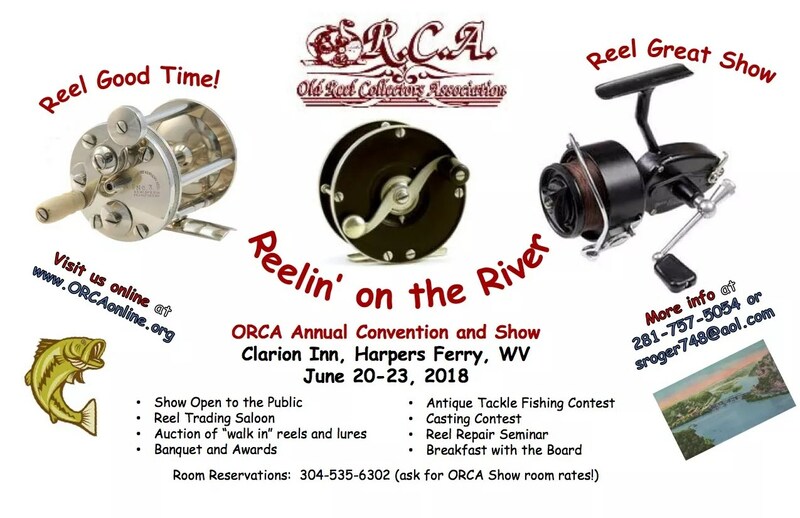 The 2018 ORCA National Convention will be held at Harpers Ferry, West Virginia and run from Wednesday evening, June 20, through Saturday afternoon, June 23. All events, except for the fishing tournament, will be held at the host hotel, the Clarion Inn, Harpers Ferry. We have a block of rooms reserved in the main building of the hotel, in which the show and social gatherings will also be held. The reduced ORCA rate for rooms is $110/night. The Clarion’s phone number is (304) 535-6302. Mention you are a member of ORCA to receive the reduced rate. The fishing tournament will be held on the Potomac and Shenandoah rivers, that come to a confluence in Harpers Ferry. The Potomac has a world-renowned smallmouth fishery and offers the rare combination of very fast action and big fish. It also offers excellent fishing for walleye, musky, and catfish. Besides being an accommodating and affordable venue for the show, Harpers Ferry has lots to see and do for family members and friends. The scenery is beautiful, with mountains that inspired the John Denver song “Take Me Home Country Roads”. The area is a Mecca for outdoor sports: whitewater rafting and kayaking, mountain biking, hiking trails, and zip lining are all within walking distance of the Clarion. The hotel is also next to a portion of a National Park Historic Site (Harpers Ferry, of John Brown fame) and less than two miles from “old town” Harpers Ferry. Washington, D.C., with its plethora of free museums and sites, is an hour away. We also have a couple of new events shaping up for the 2018 convention including a reel restoration clinic and a “Reel Trading Saloon” night. More about those to come!